The eternal search within sport for meaning in marginal gains often proves little more than a false dawn derived from false hope. However, it would seem illogical not to marry Glenavon’s impressive run of late goals this season with the hard yards put in following investment in specialist summer strength-and-conditioning work. 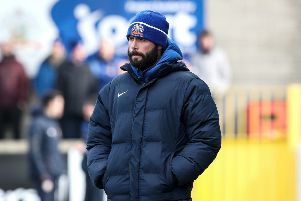 Glenavon boss Gary Hamilton is certainly happy to highlight the extra energy on show from his players during a sequence of four wins and a draw in the Danske Bank Premiership. On each occasion of the Lurgan Blues’ unbeaten run, Glenavon finished as the final side to score. The sole anomaly arrived with defeat to league leaders Coleraine. Summer signing Andrew Mitchell returned to the club he supported as a boy holding the honour of last season’s leading senior league scorer. The feared forward has kicked off life back in Lurgan with injury-time goals against Ballinamallard United and Ballymena United, plus the full stop on Glenavon’s weekend win over Carrick Rangers. Bobby Burns’ opening-day delight at a goal on 78 minutes secured victory over Warrenpoint Town and he was also on target against Ballymena, with the clock reading 81. Josh Daniels stepped off the sidelines and on to the scoresheet to secure a draw with Glentoran by scoring on 87 minutes. Glenavon appear to be enjoying an end product that started with so much summer slog.